Peeve of something is really pointless. Create your own story, then you will know there are so many ways you can do, to get a happiness. Yeah, beginning of this year, maybe we got same problem with domestic flight tickets price. Now its getting higher in Indonesia. 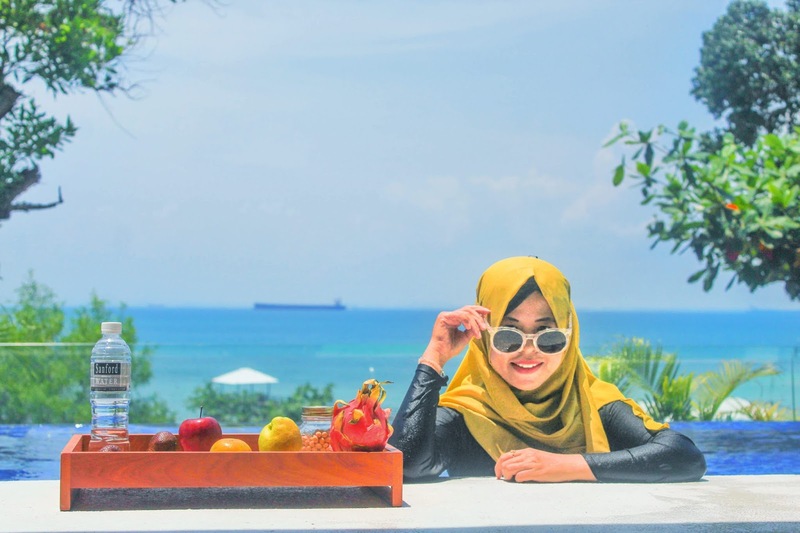 The choice is, go to holiday with an expensive price of flight ticket or choose a vacation in a classy place in the area where we live. So based on the best choice, me and my friend decided to choose a vacation at a luxury resort located in the Nongsa area, namely Montigo Resort. 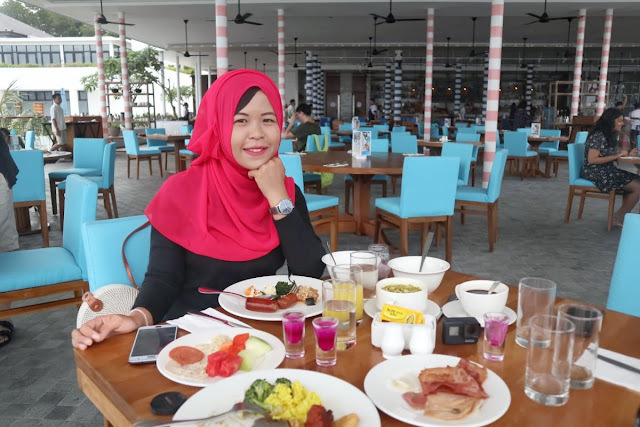 At this time, Montigo Resorts has two resorts in Indonesia. 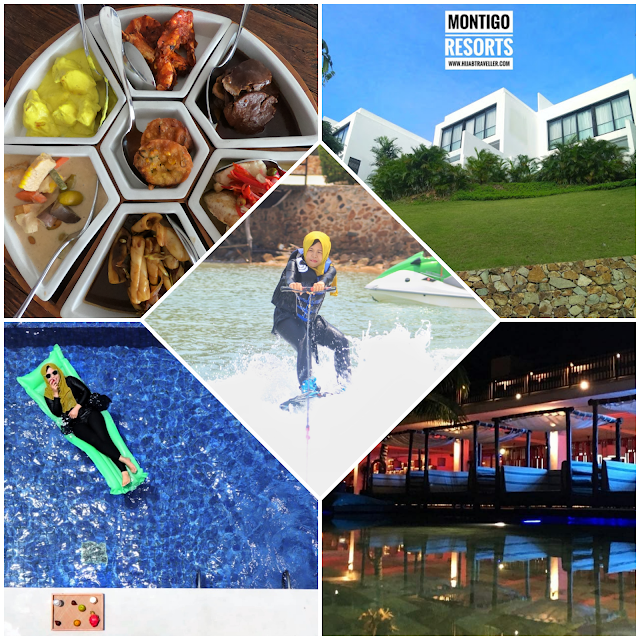 First, Montigo Resorts Nongsa at Batam, and second is Montigo Resorts Seminyak at Bali. Its under auspices of the KOP Limited SGX Catalist. 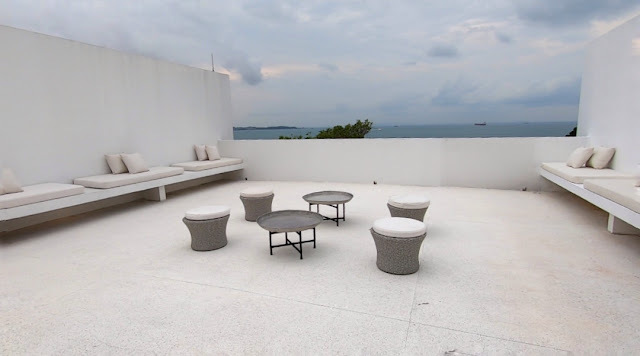 Located in Nongsa, the northern coast of Batam. 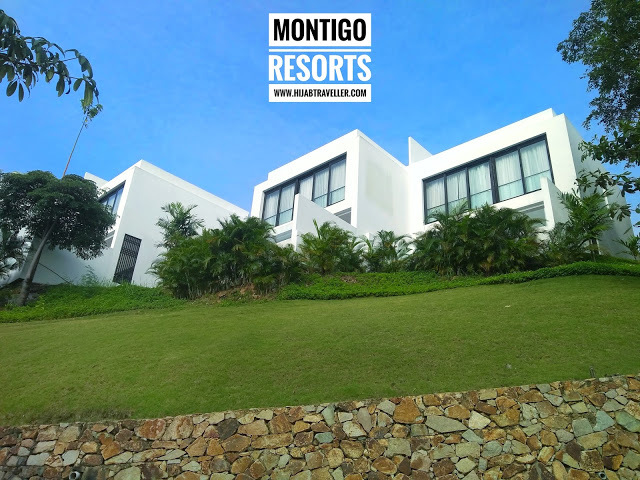 Just need 5-minute drive from the Ferry Terminal Nongsa Point Marina to Montigo Resort. 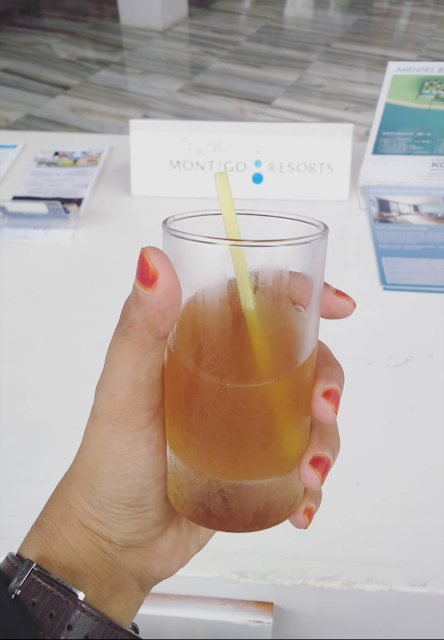 When I arrived, the weather was quite hot that afternoon, but returned refreshed after I drank the welcome drink with the ginger and lemongrass flavor given by the Montigo staff. After the check-in process, we were taken to the room using buggy because this area is very spacious. If walking, it feels very draining. Buggy services are available for all guests staying. 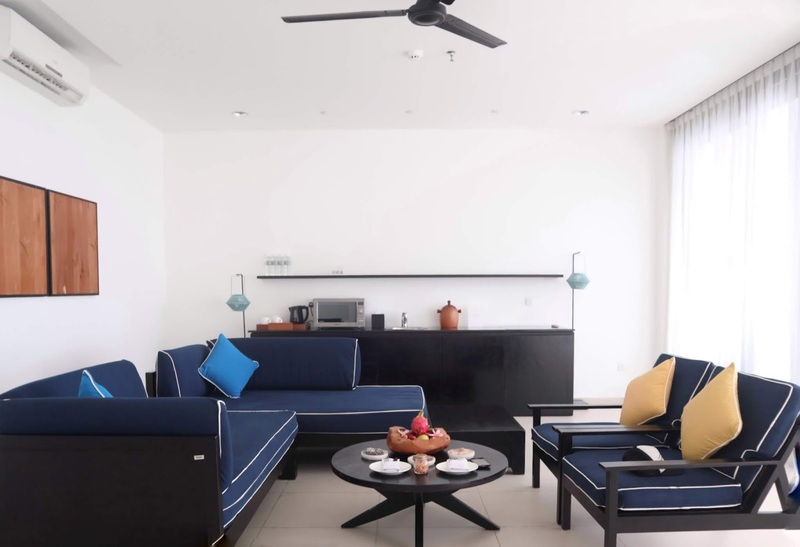 Montigo has facilities and services include several luxurious pools, a fitness centre boasting beautiful sea views, a tennis court, a water sports centre, babysitting service, and buggy service to every corner of the resort. MICE facilities include a business centre, a spacious ballroom and other meeting rooms and events spaces. And you can enjoy a relaxing massage at the spa, play tennis, or use BBQ facilities. Money Exchange service and rental vehicles are available at the tour desk. 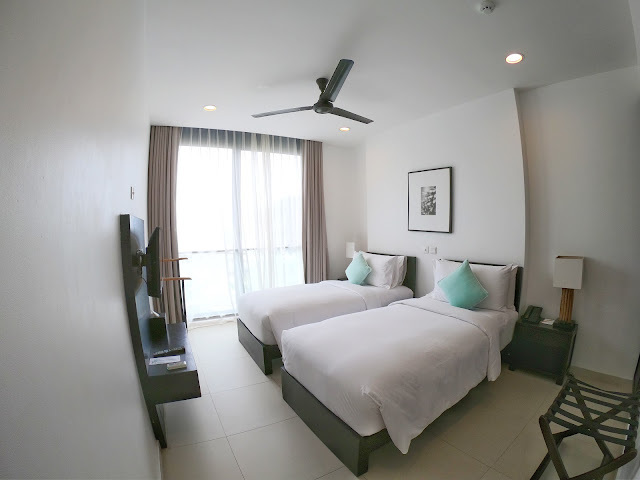 Montigo Resorts has three types of lodging. First is Residence, second is Villa and third is Studio. Me and my friend stay at villa 2 bedroom number 71 with sea view. This villa consists of 3 floors, which first floor is living room area with sofa, LED TV, small kitchen, dining table and swimming pool. Second floor has two room with bathroom. And third floor is balcony with white sofa. Visitor can use it for barbeque activity at night or just for a relaxing place to enjoy the resort atmosphere. 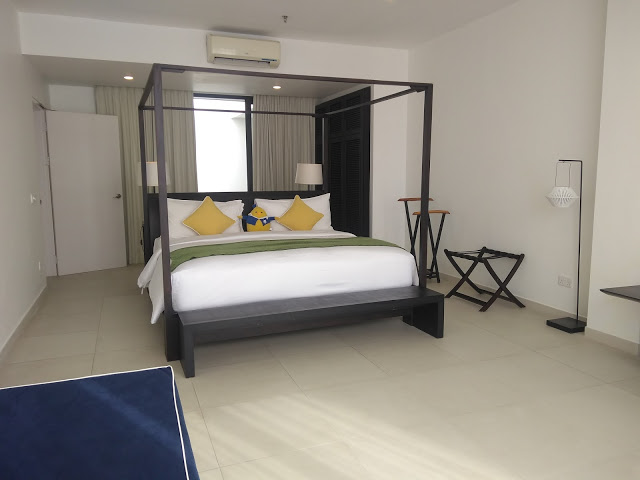 Our room on the second floor is very spacious, equipped with long sofa, Led TV, Air conditioner, fan, cupboard with bathrobe, iron complete with board, deposit box, dressing table, hair dryer, slippers and protection equipment from mosquitoes. 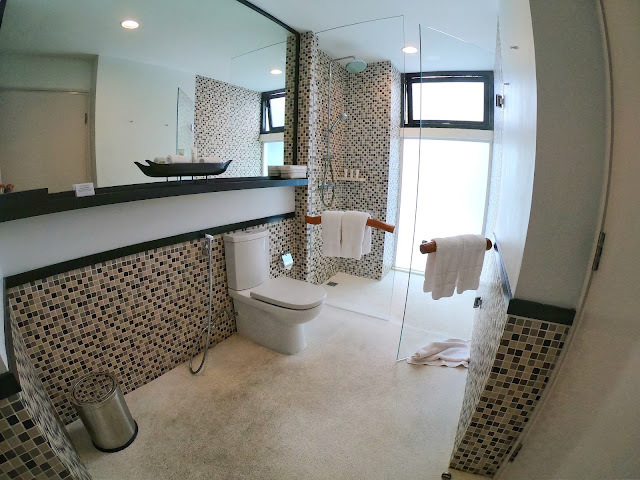 One of surprisingly in our room is the size of the bathroom which is very large and classy. 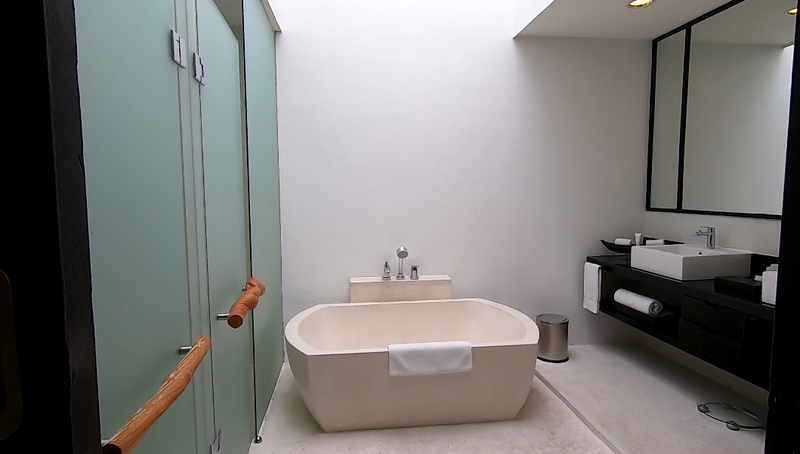 There is a large size bathup, two sinks with wide glass, separate shower and closet as well. 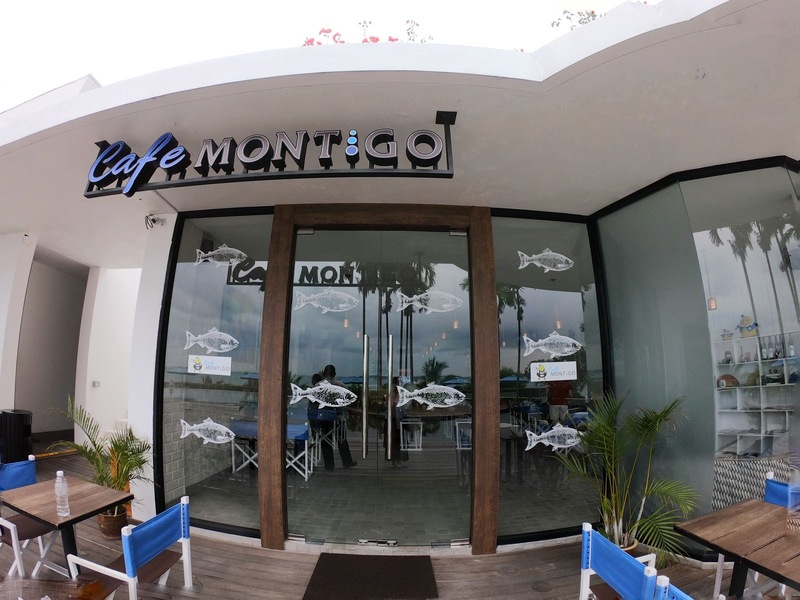 Its time for lunch, we’re going to Cafe Montigo. 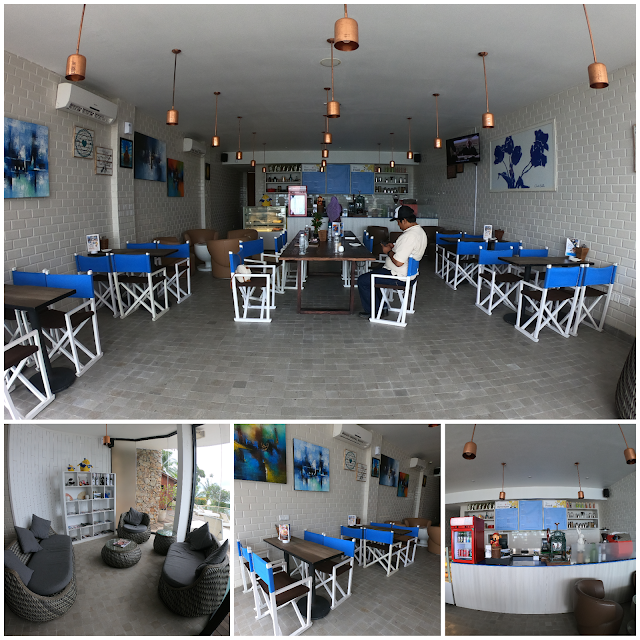 This cafe is open to the public, for guests who do not stay. 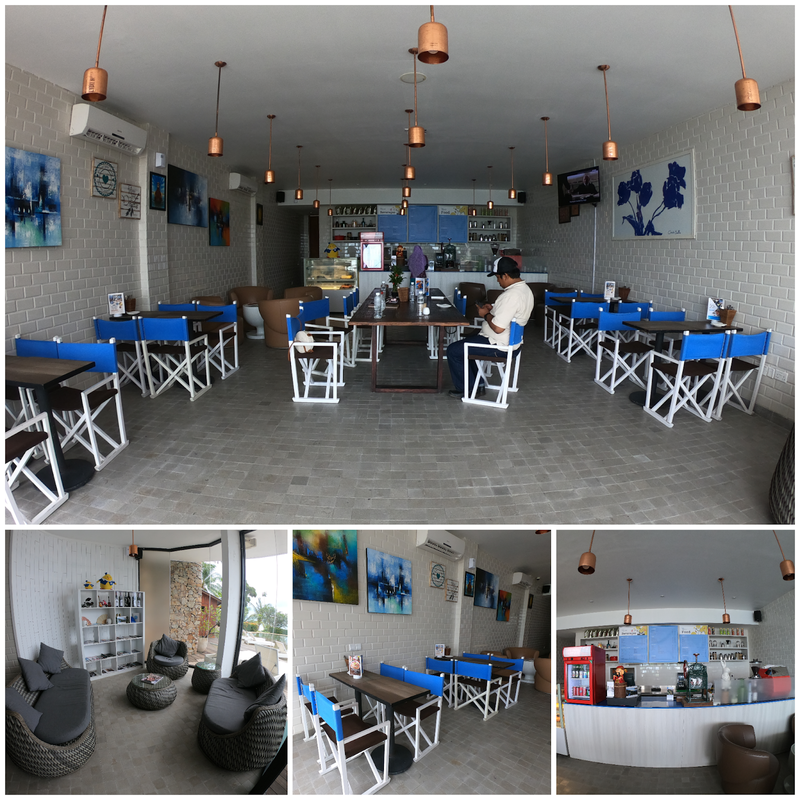 Café Montigo serves up a quaint and cosy space for friends and families to get together. While waiting for the food, visitors can relax in the area to the right side of the cafe, while reading a magazine. 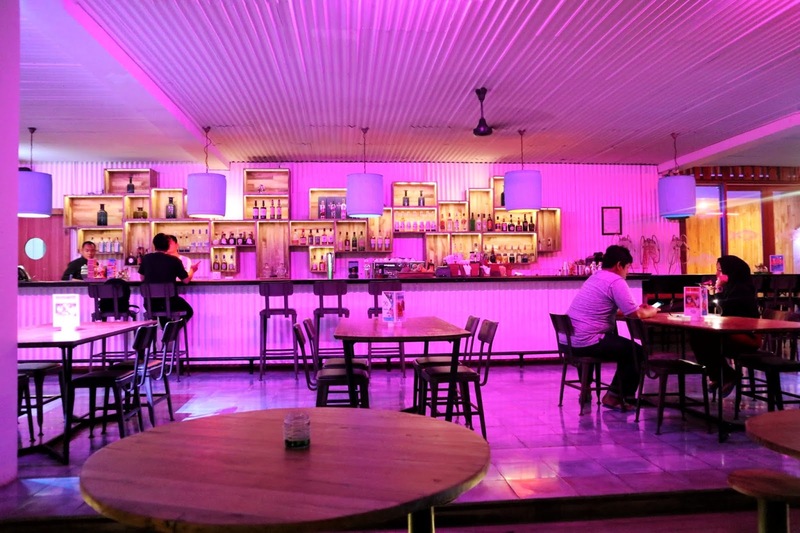 Initially Café Montigo was first opened in Singapore and is now present in Batam. 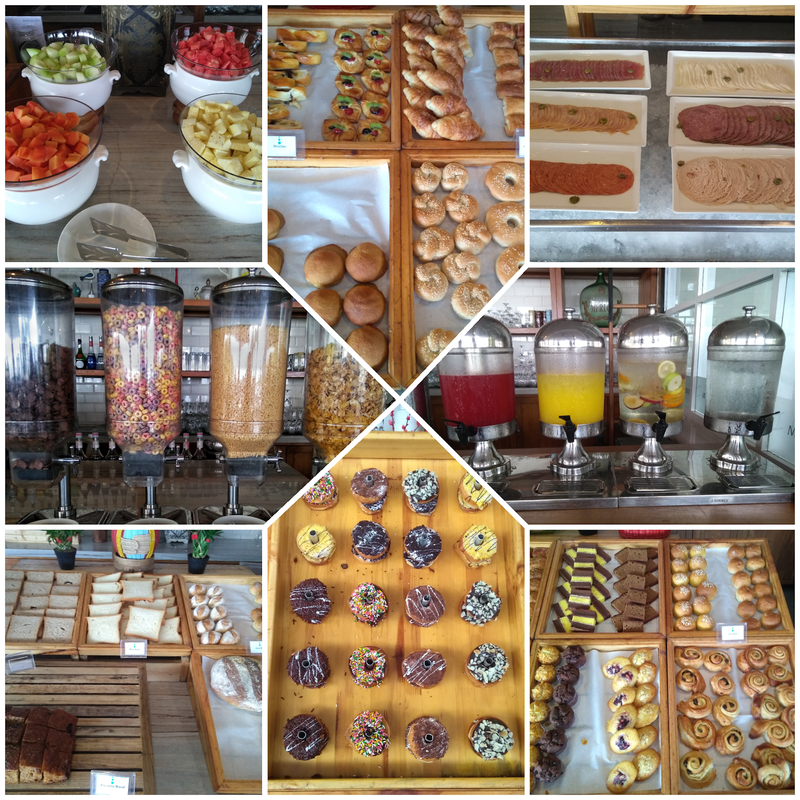 Visitors can enjoy various types of food provided by the café. For lunch we choose Rijsttafel set. 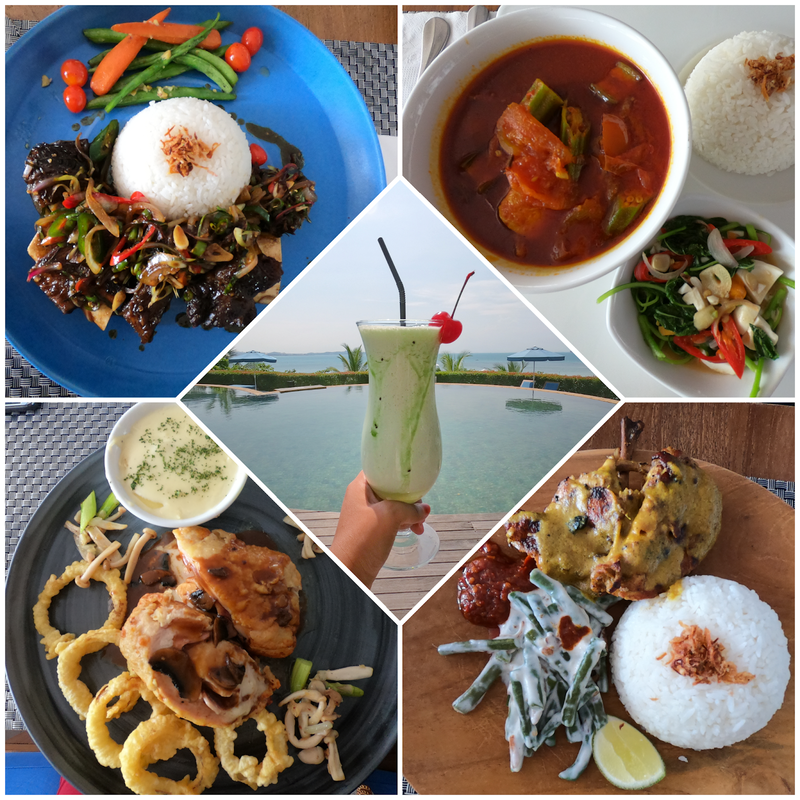 This menu consists of yellow or white rice, mixed vegetables on coconut gravy, spycy tiger prawn, wok fried squid chili lime soya sauce, glirred fillet snapper green and red chili sambal, chicken stew on coconut yellow broth, beef stew “batavia style” and sweet corn fritter. We also ordered desert and walaaa, the taste of the food is very nice. 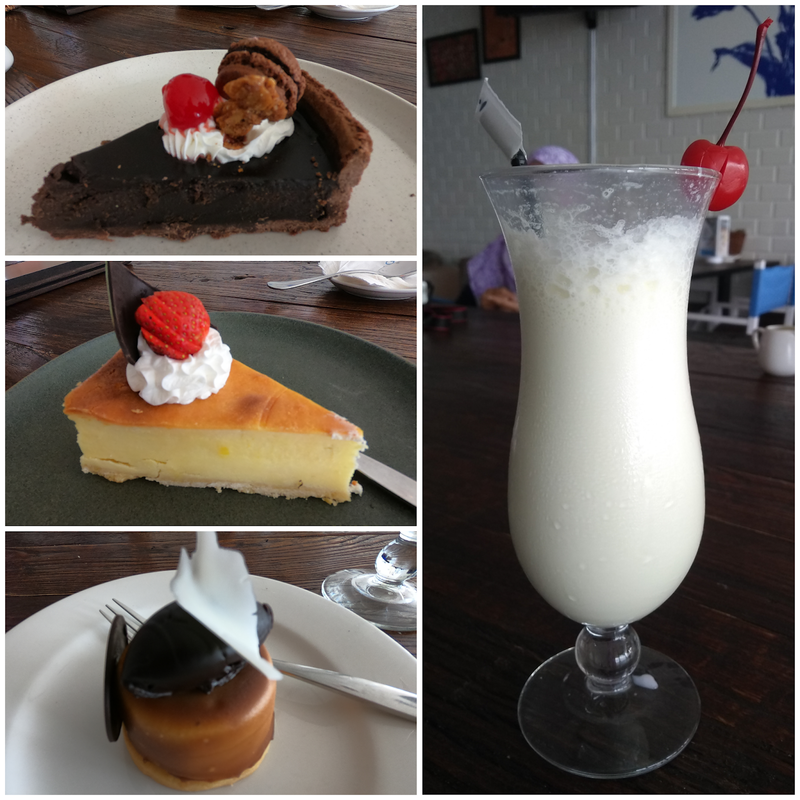 Desert: cheese cake, chocolate cake and caramel cake. After lunch, we tried some of sports activities that I will tell separately. On this post only focus to villas, food, cafes and facilities. The activity we took on the first day is archery, ATV riding and visit the Tillo Kids Club. Whereas for the second day, when finished breakfast. We tried indoor games, virtual games in the Moyo room. After that, we tried playing air soft gun while waiting for the tide because we want to do jetski and wake boarding activity. This building made from bamboo. If the weather is hot, this place still comfort and keep cool. If weathers cool, this place would be warm. 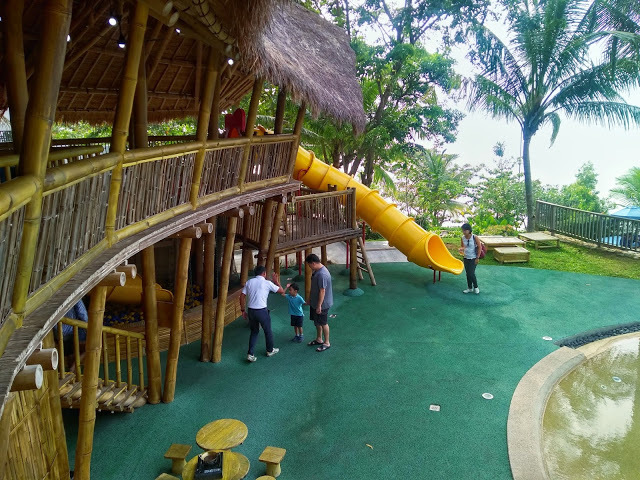 There are so many games to choose at Tilo Kids Club, such playing at wading pool, private cabins stocked with board and video games, and communal spaces offering fun-filled activities such as guided arts & crafts. It's free and available for children aged from four to twelve years. If your children wants to play with staff, you can pay more. They will play and seeking the whereabouts of Tilo (stuffed baby chicks), or doing baking sessions. And for information only, Tilo is a mascot of Montigo. Children's activities at Tilo Kids Club starts from 9 am and finished at 4 pm. Located at the tip of the resort with a view overlooking the sea and has a swimming pool in the front. Unwind in the comfort of shaded outdoor loungers, at the sand park or on the cabana beds. 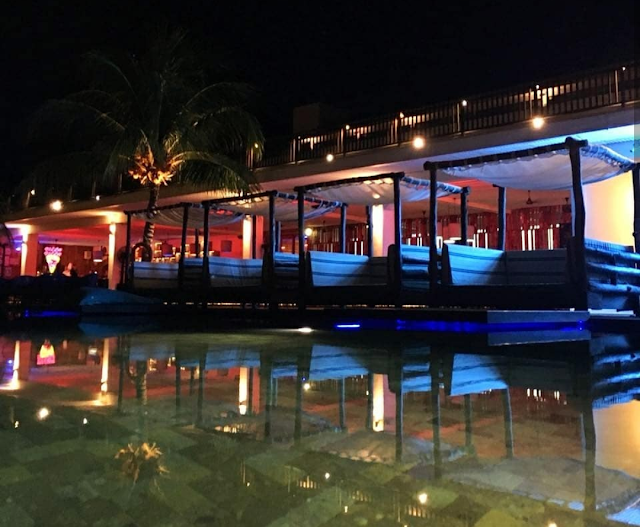 The perfect time to relax and enjoy the beautiful view of Tiigo Beach Club is in the afternoon, where we can see the beautiful orange light, down to the horizon. Sunset at Tiigo Beach Club is very charming. Tiigo Beach Club open from 9.00am to 23.00pm. 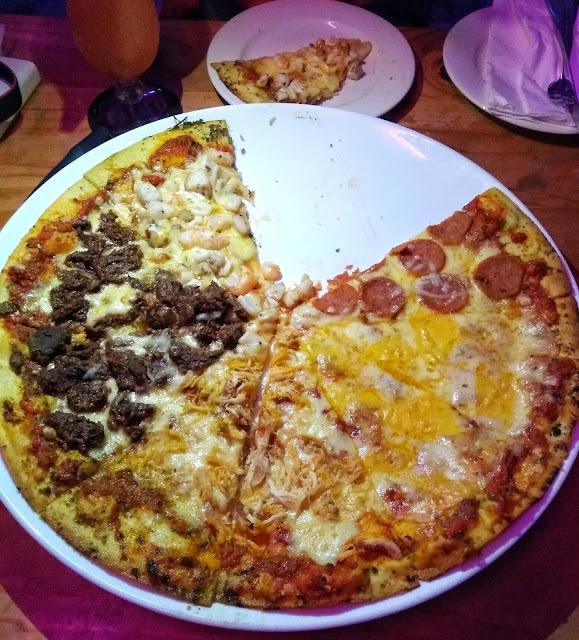 For that night we ordered one of signature food at Tiigo Beach Club and yeah, this is second time I ordered same menu because I really love it, Tiigo 555 pizza yeaaaah. The pizza is very large, 50 cm in diameter consisting 5 different cheese and 5 kind of topping and condiments. 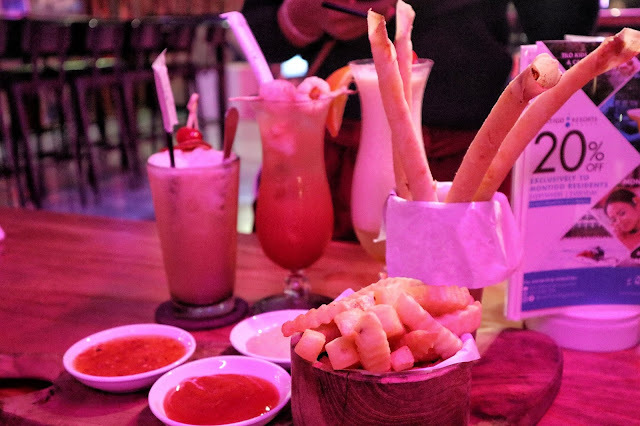 We also ordered Chicken and prawn cigarette, consist of minced chicken and prawn, spring roll skin and served with Thai sauce. When finished dinner, let sleep to get a better condition for tomorrow ^-^. Tadds restaurant provided western and traditional menu for breakfast, there's a lot of food and varied. 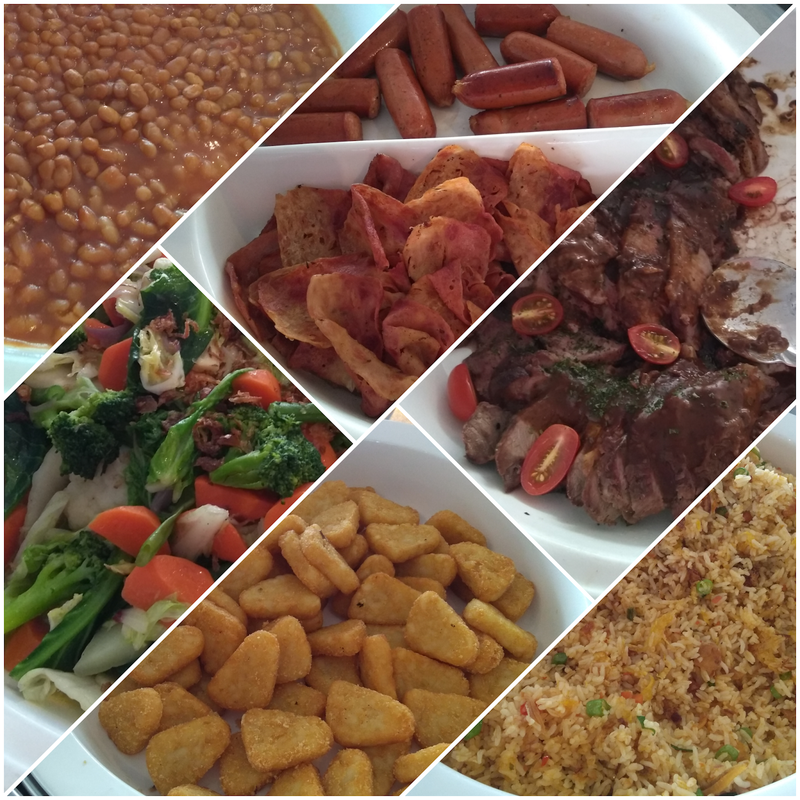 Breakfast are composed of yellow rice, sausage, hash brown, slice beef, mix vegetable, chicken porridge, chicken soup, fried rice and some other foods. 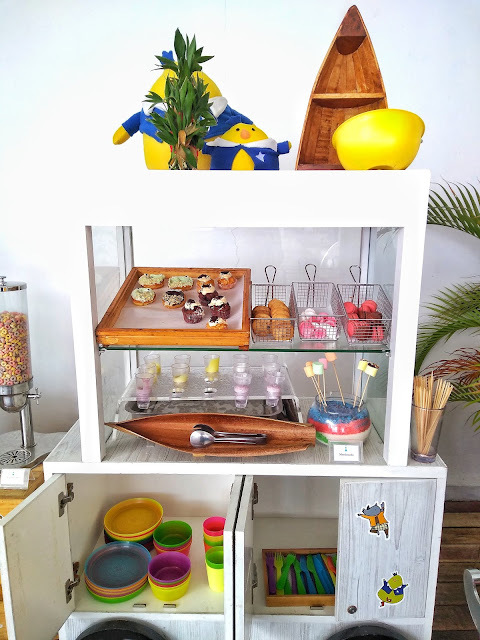 There’s also has pastry corner, yoghurt, cereal with fresh milk, salad, fruit, pancake, waffle, juice, coffee, and infused water. 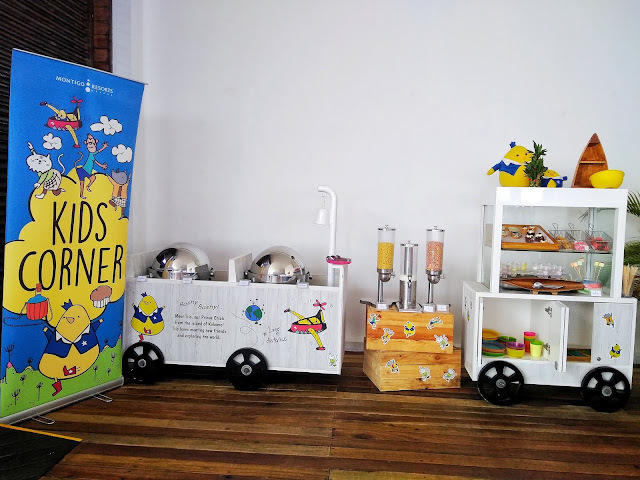 Not only provide food for adults, Tadds Restaurant also provides kids corner for breakfast. For kids corner, Montigo provide hash brown, sausage, dougnut, cup cake, biscuit, marshmello and cereal. one thing that caught my attention, children's tableware look colorful, the plates and the spoon. I am very satisfied staying 2 days 1 night at the Montigo Resort. The staff very friendly, the food is tasty and most importantly, the bed was super comfortable. 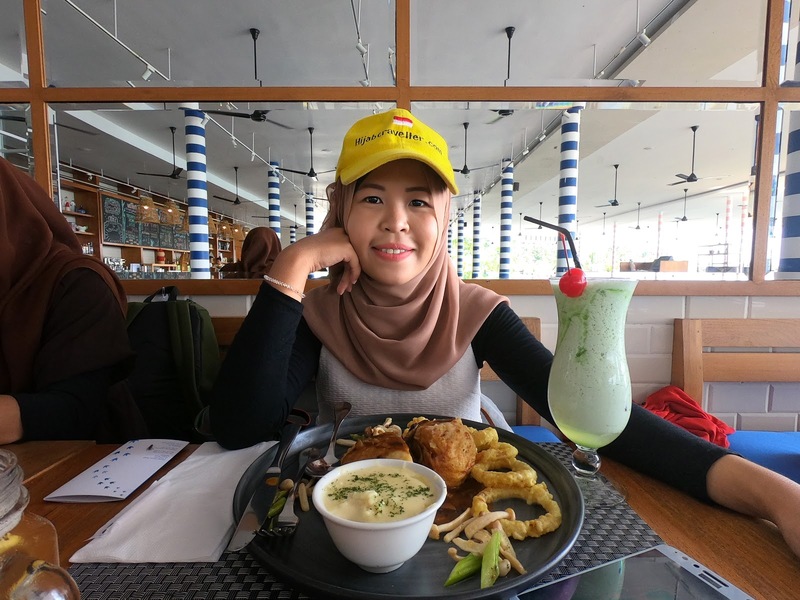 See you, I hope you enjoy to read my review. Kota Batam, Kepulauan Riau 29465. Hahaha, sa ae nih si Ade. Ia kak, karena tempat liburannya super nyaman jadi reviewnya juga bias lengkap hehe. Liburan di sini juga kak, ngerasain sendiri gimana asiknya hehe. It's really a premium holiday babe, feel envy to able feel it as well. 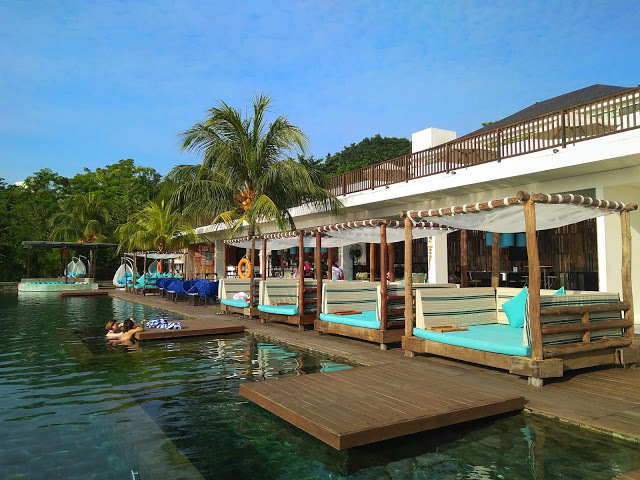 Perfect resort ever in Batam. Wkkkk, don't be envy. 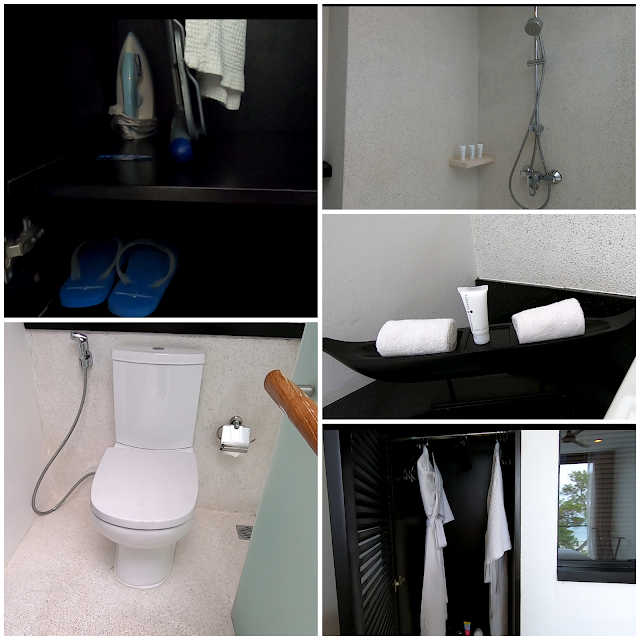 Hopefully you can have a luxurious holiday at this resort too ^-^. Wkkkk, let's tag your future husband, so after marriage you can have a luxury vacation here too sist. And yes, it's worth it. Vacation at this resort with all the facilities and conveniences offered. Hehe, bahasanya standart aja ini bang. kalau sulit, monggo pake translate aja dah, mudah dan cepat. Semoga nanti Andi bisa liburan ke sini juga ya, aamiin. Biar ga mupeng lagi hehe. Hihihi, ayo berdoa biar bisa ngerasain nginap di Montigo Resort, sesekali liburan di dalam kota aja, ga perlu keluarin budget buat tiket pesawat hehe. wih liburan mevvah wow kk wow. Ah si Bos juga bisa liburan mewah, tinggal cuss, eaaaakk. Anakh Soeltan yang tertukar broh wkkkk. Keren banget tempat nya, komplit-plit. 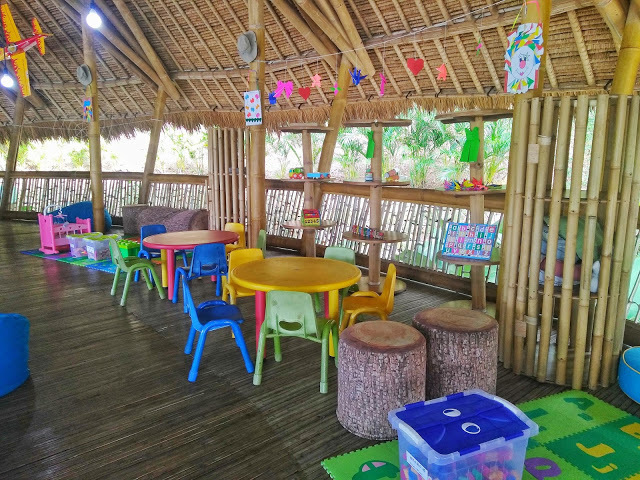 Ada kids cornernya lagi..
Mamak-mamak pasti seneng banget kalo liburan ke tempat yang ada kids corner yah kan, tenang sikit hatinya kalau anak senang. Glad to see you are interested with my blog post ^-^. one of problems this year is highly price domestic ticket. damned!!!! and of course lucky us as an Batamers, there is always a way to staycation. and Montigo ressort is a good choice. Nice information btw. Pengagum senja, pecinta coklat dan menyukai dataran tinggi. Makasih buat yang udah mampir. Tulisan dan isi blog adalah milik pribadi. 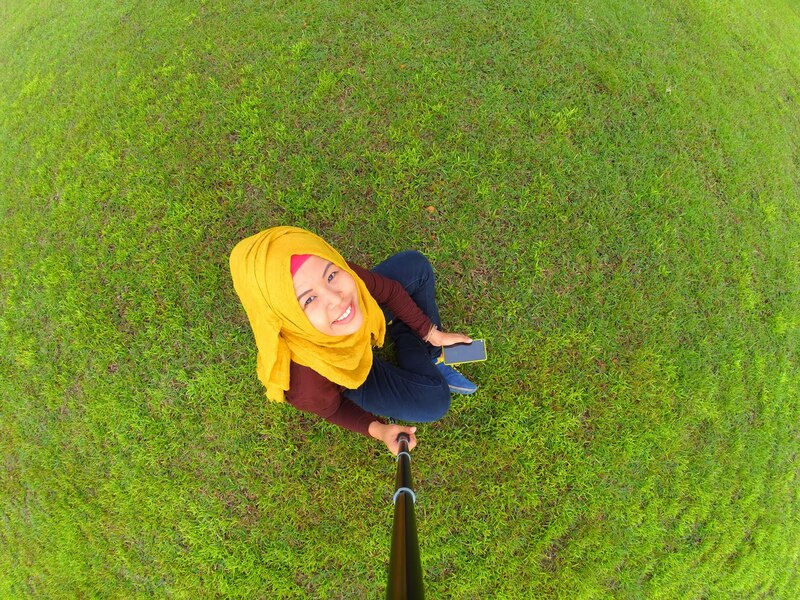 Hijab Traveller. Powered by Blogger.